With the stifling low hanging cloud of finals week in full effect, the only noise that lingered in the halls of Seattle Central Community College were the scraping sounds of wire brushes, the slosh of mop buckets, and cheerful laughter. 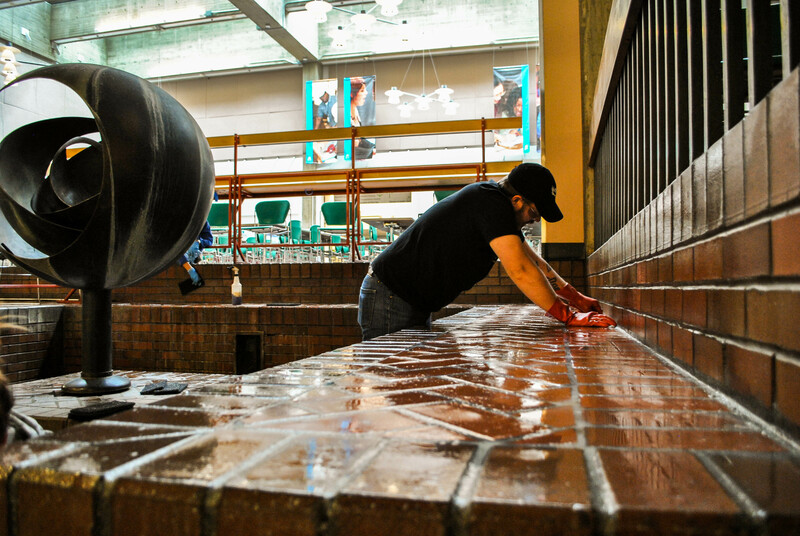 The Tsutakawa fountain, an SCCC community landmark, was getting a long overdue wash from a collection of motivated faculty, staff, and students. The volunteer group cleaning on Thursday December 12th was one of the first steps in the long process of getting the fountain up and running again. The Fountain Committee, a group of SCCC community members who feel strongly about making the fountain come back to life, organized last Thursday’s cleaning event. Due to the over two year-long contentious struggle with the administration over whether to go forward with the fountain project, the committee has taken it upon themselves to raise funds and get the ball rolling on the restoration. The Tsutakawa fountain has more significance than simply being a flashy piece of artistic water engineering. The artist who crafted the fountain, George Tsutakawa, attended Broadway High School, the former academic institution that was located right where SCCC currently resides. During the climate of hyper paranoia and racism that blanketed the World War II era, many Japanese American students from Broadway High School and Capitol Hill community members who were rounded up and sent to inland internment camps. Many family members of Tsutakawa were among them. “People who [currently] work at SCCC were incarcerated or had family members who were,” said Tina Young, Director of Multi-Cultural Services at SCCC and key organizer within the Fountain Committee. “It’s supposed to represent that global sense of humanity,” Young added. 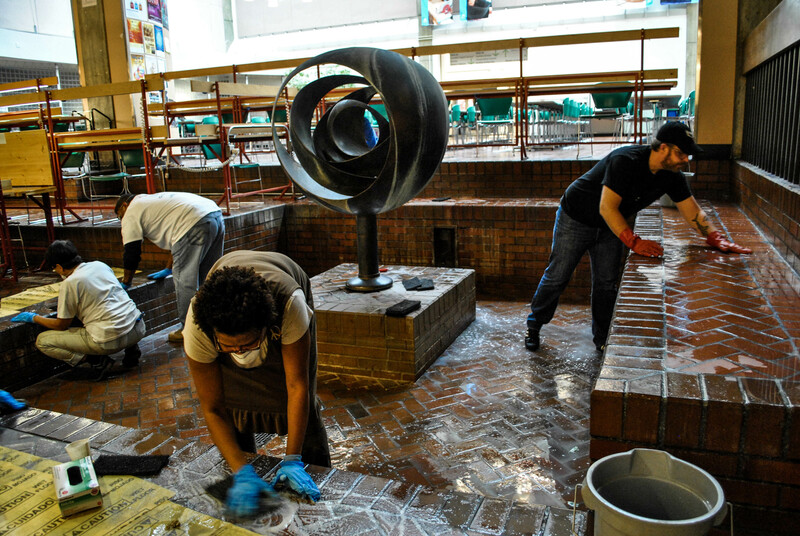 Olesya Gonta, an international student who assisted in the cleaning noted the diverse student population at SCCC and resulting relevance of the fountain’s history and symbolism as reasons to why it is important. After gaining notoriety as a renowned contemporary artist, Tustakawa went back to his roots and gifted SCCC with the fountain in 1973. The primary work that has to be done on the fountain is fixing cracks in the brickwork and doing away with the wax and grime that has accumulated over the years. In order to keep costs down, the Committee decided to do the initial cleaning themselves in preparation for professional contractors who will eventually do the complete repairs. “We’re helping clean some of this brick work so that contractor doesn’t have to do it which would cost more money,” said Young. Ken Matsudaira, curator of M. Rosetta Hunter Art Gallery at SCCC, and Tracy Lai, a history professor, have represented the Fountain Committee in the contractor proposal selection process with aid from David Ernevad, SCCC Manager of Capitol Projects. Out of three different company proposals they have chosen the Pioneer Masonry Restoration Company due to the company’s experience and coherent expectations for the project. “It’s such an important part of the community and it has so much history that it is worth preserving,” said Ernevad. The brickwork is planned to take place over winter break and is expected to take roughly two weeks. After this phase has been completed, the fountain can technically be turned on. However, due to concerns within the administration about safety and sanitation, it will not be running right off the bat until these minor issues have been addressed. The Committee has raised more than $21,000 as a result of a fundraising event they hosted last spring, funding from SCCC Associated Student Council (ASC), as well as different donations from individuals and the local arts community. However, this is far from enough. In fall 2012, SCCC Facilities office and President’s cabinet had set an estimated budget of $80,000 for this project after initially wanting to sell the fountain. However, following a New City Collegian investigation last spring, it was found that this number was not based off of any realistic cost engineering research and seemed to be merely a false deterrent to those keen on making restoration happen. However, these are the only contractor estimates that the administration has decided to use and has agreed to fork over half of the total cost if the Committee can come up with the other $40,000. The effort of the Fountain Committee is not close to being over, despite their hard work within the last year raising funds and amassing support within the SCCC community. Young mentioned that plans for another fundraiser with live music in February are underway. The Committee has set June 2014 as the tentative finish date for the project.